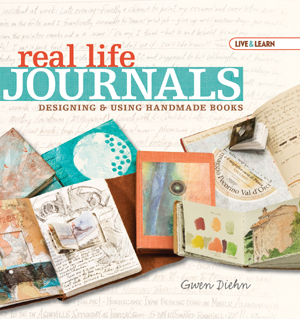 Real life Journals, Designing and Using Handmade Books is a wonderful new book from Lark publishing. It’s a large hard cover book perfect for anyone who wants to make their own journals or books. From beginning to end you can choose your own paper, put your journal together and then fill it with writing, art work, photos, or whatever your hearts desire. I think it makes it so much more personal to make your own book to begin with, then it really is your very own personal journey. This book asks you specific questions about what your needs are and helps you choose exactly the right kind of book to make. There is even a handy take along booklet about this you can carry with you anywhere. The first part of the book covers different artists going through their own “book binding adventures” choosing the right style of book for them, what they did, did it work, etc. The second part of the book deals with the basics of book binding like what tools and materials you’ll need, choosing the right papers, using different art mediums like painting, drawing, etc. There is also a nice pull out poster that covers the essential steps of book binding, perfect to hang on your studio wall. The last and main part of the book covers sixteen different styles of book making from easy glued projects, pamphlets with only a few pages, how to spiral bind your book and more complicated stitched and sewn bindings. Each project has very detailed step by step instructions along with figure drawings for most steps and photographs of samples. Real Life Journals will help you get started if you’ve never made a book before but will also inspire you and probably teach you some new ideas if you’re a seasoned book maker. It can be found here at Lark publishing. Wow this looks like a great set of books. Amazing collection i would love to get my hands on them.